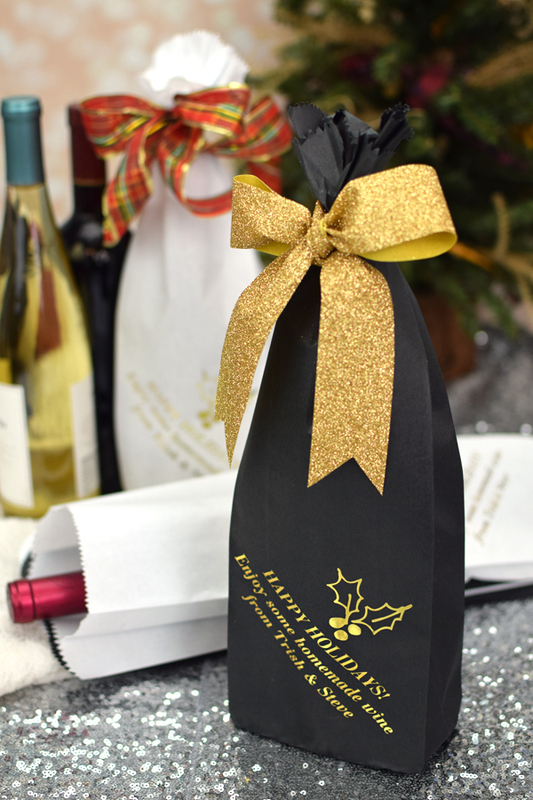 Give guests some homemade wine this Christmas season or the holiday hostess a special bottle of bubbly packaged in these custom printed wine bottle paper gift bags. Insert your favorite bottle of vino, tie with a festive bow and voila; an instant hostess gift. Personalize your bags with a design and three lines of text to say a special thank you message. These bags also make great Christmas gift ideas for company holiday parties for employees and coworkers. Available in white or black paper, each bag will hold one standard size 750 ml bottle of wine. Bags measure 16 inches tall by 5 inches wide. This product is great quality and makes a classy statement. ItÃ¢â‚¬â„¢s easy to personalize and present that always welcome gift. Quality product to personalize an always welcome gift. Great Job. The bags work perfectly for our event! They were well made and beautifully printed. Thank you!